If you keep up with our blog regularly, you’ll notice that we don’t communicate quite like most dentists. Maybe this comes from the fact that we see ourselves as a business second and patient resource first or maybe we just like being different. Either way, today we’ll do tell you something that very few dentists and patients talk about: It’s okay to get a second opinion. While most dental offices offer general dentistry services, not all dentists make general dentistry their primary focus. For many dentists, endodontics, orthodontics, oral surgery, cosmetic dentistry, and other types of treatment divide their attentions. As a patient, it is easy to see one dentist as the same as any other dentist, but that isn’t quite the case. While we aren’t going to say that dentists don’t know what they’re doing, that would be incredibly unfair and misleading, we will say that not all dentists are going to agree with the diagnosis another would have put forth in the same situation or have access to the knowledge necessary to make the absolute perfect diagnosis for your situation – and that’s okay. You shouldn’t grow a distrust for dentists, but if you feel like your dentist offered you a drastic solution for what you feel like is a simple problem, then it doesn’t hurt to get a second opinion to see if an alternative treatment is possible. Some dentists use wildly different technologies for their treatment offerings, which can slant their diagnostics one direction or another. For instance, a dentist that is well-versed in laser-based surgical techniques is more likely to offer that as a treatment path over another dentist that focuses in general procedures, extractions, and implants. The technologies present in your dentist’s office will have a surprisingly large impact on their diagnostics, as well as your treatment options and the costs associated with those. While it may seem like you’re going behind your dentist’s back or failing to trust their diagnostic abilities, it is okay to request a second opinion from another local dentist. Neither dentist in these situations is going to see this as a better or worse situation, both recognize that they’re trying to do the best possible thing for your situation, but medical opinions (however educated and experienced) are still opinions, and are therefore subject to being not entirely right or just plain wrong. By and large, dentists do a great job of taking care of their patients and earn the trust that they get back from them, but they also recognize they are human as well, which gives you the right to seek a second opinion without feeling guilty or outside of the norm. 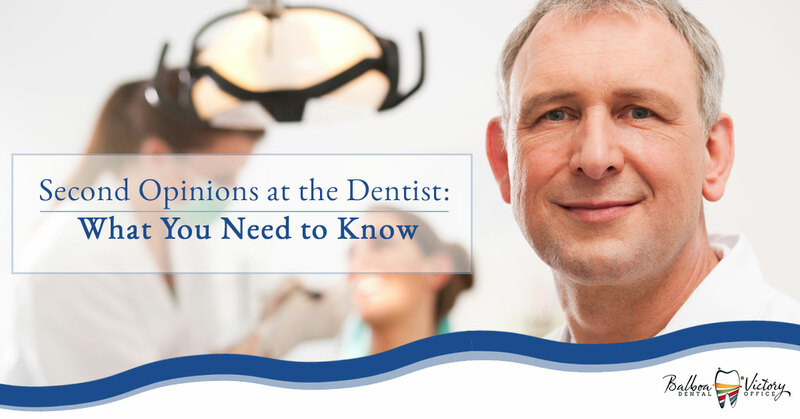 If your dentist comes back into the exam room with your x-rays or finishes a diagnostic probe in your mouth, only to tell you some news that you are not at all excited to hear, don’t check out! The worst thing you can do in this situation is glaze over and begin to think about how you’re not going to pursue your dentist’s recommended treatment method or immediately commit to the idea of a second opinion. Instead, take advantage of your dentist as a resource of the latest possibilities in dentistry and a doctor that has sworn themselves to offer their knowledge and services to you as their patient. Basically, you need to ask them. When you hear something you don’t like, just simply ask “what other alternatives are there?” Feel free to ask if they’ve heard about any other treatments or procedures that can circumvent the thing that you’re uncomfortable with and ask them to explain why until you’re satisfied. From there, if you feel like you’re still unsure, you should absolutely seek a second opinion. Just know that your current dentist can’t possibly read your mind or know that you’re uncomfortable with the treatment they have recommended; if they don’t know, they can’t help you find alternatives! Get in touch with the friendly staff at Balboa Victory Dental for any hesitations you may have with your situation. Our team is well-versed in many major dental procedures and best practices, as well as which other Encino and Lake Balboa dentists can help you. If you ever have any questions about one of our diagnoses, feel free to leverage our team as a resource to find a place for a second opinion or a way to make our dentists understand your concerns. Our office is proud to accept many of the major insurance companies, as well as many local providers that are specific to Encino and Lake Balboa patients, plus we often see Denti-Cal patients, as well. Get in touch with our staff today to see what our dentists can do for your situation.